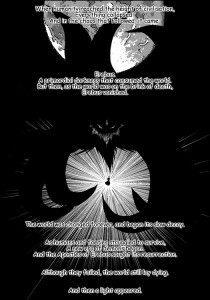 Since I released a draft of Phantasia’s first chapter for the world to see, I thought I might give some additional detail on the thoughts behind it – in this case, on the idea of ‘Theia’, or what we generally refer to as THE MOON. The name Theia is a direct reference to the Giant Impact Hypothesis said to be responsible for the formation of the Moon. In this instance, it is referencing how the Moon is spiralling inwards towards the Earth, in effect creating a repeat of the original impact (well, sort of). Here is a dramatic recreation of said impact (that’s what I wished Majora’s Mask looked like – man, that ‘moon’ was way too small…). It should be noted, however, that scientists have recently began to revise this theory, and current hypotheses suggest a smaller, faster impactor at a more direct angle, as opposed to the slower, larger ‘glancing blow’ of the original theory. Either way, the symbolism remains intact. Also of note is the origins of the name. Theia was a primordial goddess, a daughter of the Earth (Gaia). Her names translates directly to ‘goddess’. Also known as Euryphaessa – ‘wide-shinning’ or ‘far-shinning’ – she is the mother of the Moon goddess Selene, and an all-round matriarchal figure. And yes, some of this stuff is relevant, and those of you with a cursory knowledge of Phantasia (old and new) may well recognise some other names in that link. To touch on a third level of pretentious symbolism, the idea of the Moon spiralling inwards is a metaphor FOR LIFE ITSELF. Specifically how humans pass their insecurities and flaws down the generations and how, with each cycle, these problems grow and multiply. You could call it a form of emotional entropy, if you really wanted to sound like an arse (like me). Just as people refuse to face their problems and live in denial, so too does Theia come ever closer, until annihilation is inevitable. It also represents the spiral of depression, in this case on a global scale: it’s almost as if the world itself is dragging its death ever closer. Each cycle builds upon the last, things get worse, the avalanche grows in strength, and so long as people ignore or deny their issues, their problems, then things continue to get worse. If you want to see another person’s take on this concept, you could do worse than watch Lars von Trier’s Melancholia (which I only caught a year ago, while researching the whole concept, but is now one of my favourite movies). If you’re wondering, the initial idea was – much like Phantasia itself – born from dreams: specifically a recurring narrative throughout my teenage years, starting around 1995, where the Moon would gradually grow closer over the years, and dreams featuring tidal waves tall enough to touch the sky. On a more Real Life level, the change in lunar orbit presents us with some interesting possibilities. In the story, Theia/the Moon is about 100,000-120,000km distant: about 3-4 times closer than it is currently. Accounting for the wonder that is the square-cube law, that means the force of its gravity upon the tides is anywhere between 27 to 64 times its current levels. Here’s another clip to demonstrate the potential. Suffice to say, the tides around my local coastline are around 5-7 meters. If the more were 3x closer, that would be 135-189 meters. You can use your imagination for a Moon 4x closer (or more). I use the term ‘tsukinami’ (月波, I think – feel free to correct my poor grasp of the language!) in the story for such things – tsunami is Japanese for ‘harbour wave’, tsukinami? Moon wave. Or thrust-wave, which is also appropriate (the Japanese language is cool like that). For further information on the influence of the Moon on the Earth, the BBC produced a documentary a couple of years back, which you can watch here. Phew. I’m not sure if this is what I should be posting in a blog, but there you go. Is this sort of thing interesting to people? Or have I bored you all to death? !